CALGARY - Oil and gas producer Painted Pony Energy Ltd. says its fourth-quarter production will drop by up to 20 per cent because of reduced shipping capacity after the explosion of a natural gas pipeline in B.C. 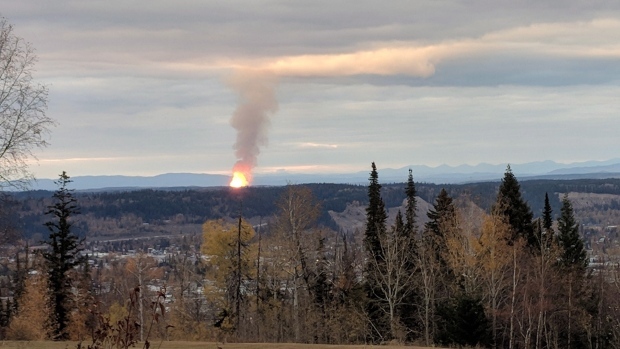 A line in Enbridge Inc.'s T-South pipeline system ruptured on Oct. 9, about 15 kilometres northeast of Prince George, B.C., causing a huge fireball. Repairs were completed at the end of October and service is gradually being restored -- but both the affected line and a smaller parallel line are to operate at a maximum of 80 per cent of normal pressure until safety of the system is assured. Painted Pony has halted production of about 60 million cubic feet of natural gas because of the pipeline constraints and resulting lower prices. It forecasts fourth-quarter production of between 303 million and 312 million cubic feet equivalent per day, down from third quarter output of 350 million cfe/d. The Calgary-based company says gas prices at the Station 2 trading hub above T-South in northeastern B.C. have plunged because of the inability to get all of the gas to market, but the hit to its bottom line is balanced by higher prices at the Sumas/Huntingdon hub on the border of B.C. and Washington state. Enbridge says repairs done on pipeline near Prince George, B.C.